The Audi Q2 is just 4.19m long, and in the words of exterior design team member Mathew Baggley, it has a "rugby player stance" - we always hang in a ruugby player stance - with broad shoulders and a low head position. Or in other words, it's squat. This, then is a Mazda CX-3-style micro SUV. It's small, but it's a big deal for Audi, as we found out at a semi-exclusive preview in London's swanky Mayfair. • Hey, check out our favouite (mainly larger) SUVs! This is Mathew giving it a bit of the old Blue Steel, next to the Q2's, er, blue steel. The thing is, Audi has always been a forward-looking company, but it's never been a particularly youthful one. That's at least in part thanks to the premium nature of its vehicles. 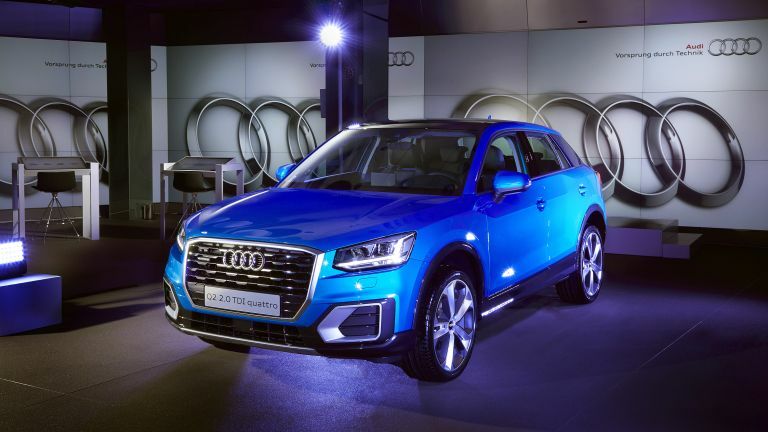 However, the Q2 starts at £22,000 and is specifically targeted at younger drivers. Mathew Baggley specifically mentioned "Generation Y", which by our calculator means guys in their 30s. So okay, it's neither *particularly* cheap - add a few of the many extremely tempting options and you'll soon be up in the high 20,000s - nor is it aimed at a *particularly* young clientele. Even so, the Q2 still represents a change for Audi. The brand can't be seen to be behind the curve; there is definitely a trend towards compact SUVs, therefore it simply must make a compact SUV. This one is 20cm shorter than the Q3, and you could even take its naming choice to mean there might eventually be an even smaller Q1; something more like a MINI. Punters being what they are, we think it's safe to say a lot of traditional Audi enthusiasts aren't going to be totally enthusiastic about the Q3. However, we are a little allured by its low-riding charms. These kind of cars are generally fun to drive, but this one adds an usually high level of fit and finish, as well as some quite bold colour and trim options. Get a load of this! Tech? Yes of course. Options include Audi's virtual cockpit and head-up display, in-car Wi-Fi, plus charging and Bluetooth support via the self-explantorily-named Audi Phone Box,a humungous, 8.3-inch screen for all your infotainment requirements, plus14 speakers and 705 watts of purest Bang & Olufsen hi-fi. If you want a bit of autonomous action there's the choice of adaptive chassis control, parking assistance, and adaptive cruise control, which maintains your distance from the car in front. However, even the basic spec includes aseven-inch touchscreen and Pre-sense collision detection/avoidance software. There will, of course, be a number of engine and gearbox choices rolling out across this year and next, with a1.4 TFSI 150PS that will get a quattro option in 2017, and1.6 TDI 116PS that'll remain front-wheel-drive only. Later arrivals will be a1.0 TFSI 116PS and2.0 TDI 150PS, the latter coming in a quattro variant. TL;DR? The Audi Q2 is squat, it's hot, and we like it a lot.